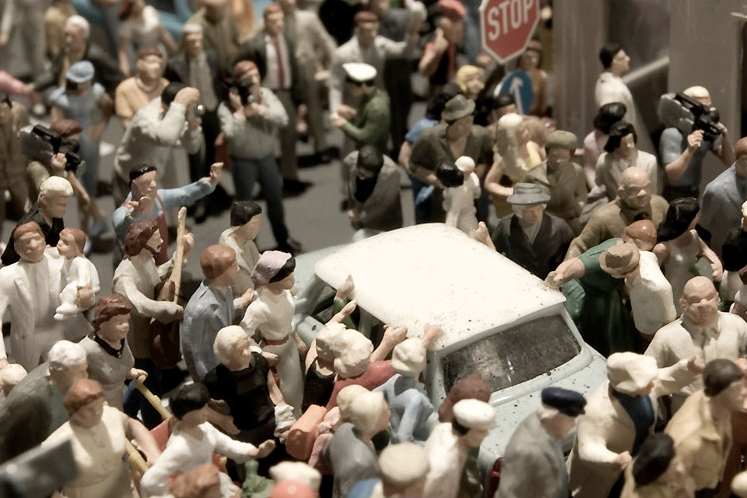 a slide-show featuring details of the show now on display at the Miniatur Wunderland Hamburg GmbH that examines pivotal moments in recent German history. 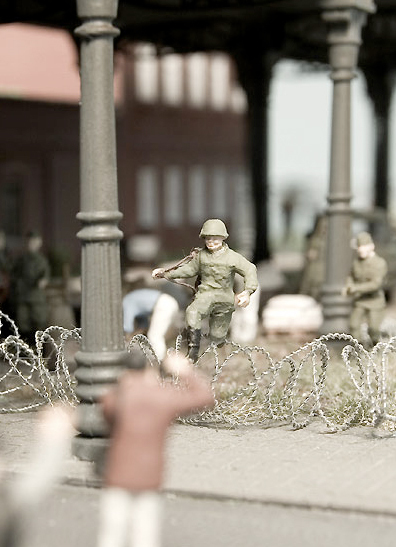 October 3, 2008 marks 19 years since the fall of the Berlin Wall. 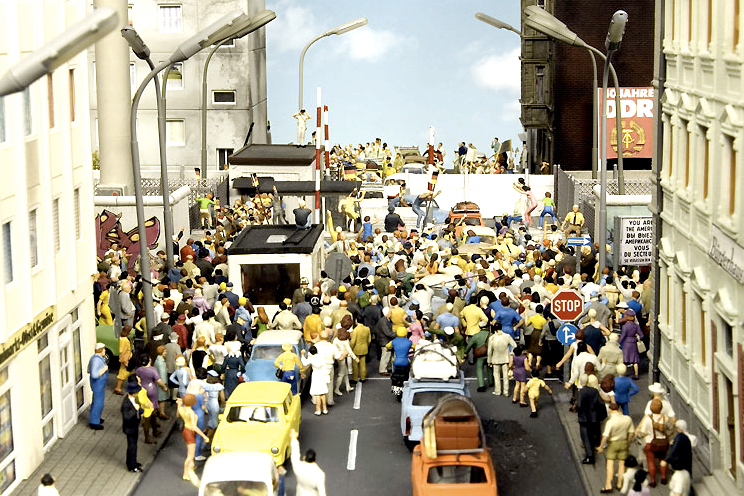 Above: From Stern, detail of Checkpoint Charlie, West Berlin, November 9, 1989. 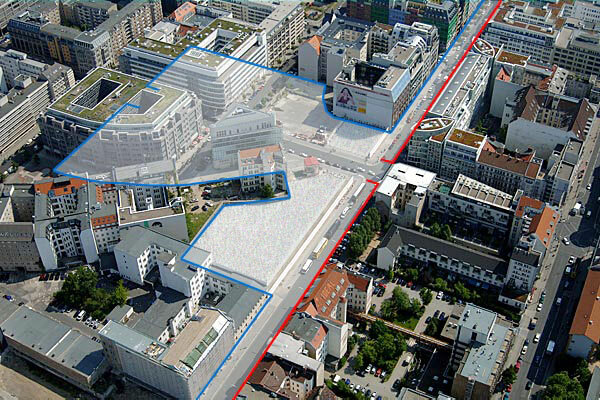 Above: From Berlin (dot) de, an aerial view of contemporary Berlin, with Checkpoint Charlie’s former position highlighted. To the left of the blue line, former East Germany. The red line denotes the wall, and to the right, Kreuzberg, home of type designer Verena Gerlach. Hallo Verena! Above: From the same slide show, the moment when East German soldier Conrad Schumann made a leap for freedom. See Peter Lebing‘s original photo below. 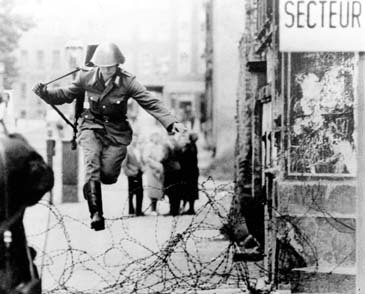 A defecting East German soldier, Conrad Schuman, leaps over a barbed wire barricade at the Bernauer Street sector into West Berlin on August 15, 1961. Schuman made his break for freedom to join his family which had fled earlier to West Berlin. This entry was posted by Erik Brandt on Thursday, October 2nd, 2008 at 7:55 PM	and is filed under Aktuell, Art, Globalization, International, News Links, Typografika.